Random And Some: Swat it! Right wing opposition party Vlaams Belang never shies away from a little controversy. In the past, they have not hesitated to turn to WordArt and cheap tactics to create hard-hitting campaigns. Remember the We've Been Milked Enough campaign to criticize the money transfers to Wallonia? Or the Freedom Or Islam campaign against islamization which they recently revisisted? Vlaams Belang does it so often that I almost don't notice their billboards anymore, but the party has outdone itself with its latest national autumn campaign. I first saw the billboard on my way to work on Thursday, and I couldn't believe what I was seeing. 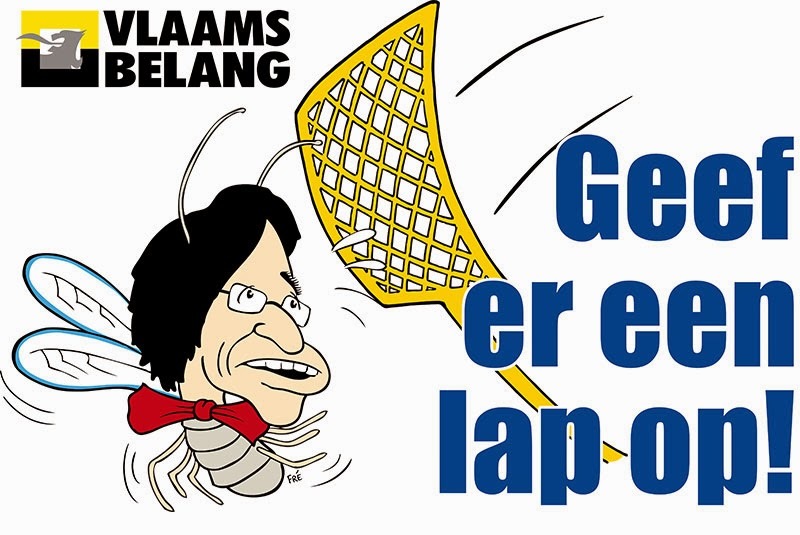 Vlaams Belang not only unambiguously depicted prime minister Elio Di Rupo as a fly - brilliant -; the visual was accompanied by the slogan "Swat It!". The cringeworthy campaign will be featured on 400 billboards nationwide. Vlaams Belang will also advertise in popular papers and magazines, spread brochures, and distribute 220,000 "Swat It!" fly swatters. Comparing the leader of our government to an insect and subtly openly encouraging gay bashing? Way to go, Vlaams belang! The crew of current affairs show De Ideale Wereld quickly picked up the campaign and spun it: they dismissed the slogan and revealed that it was supposed to be "One Laptop For Everyone", effectively making fun of Vlaams Belang and Telenet. DIW even provides nifty tool kits so that people can correct the misprinted billboards.